I just got out of a brief interview with Diablo III lead designer Jay Wilson, where we discussed a few things about the role of gender in video games and the new rune system in Diablo III, but the whole time I was in there I couldn't take my eyes off of his t-shirt. I've seen it around the convention, but this was my first chance to see it up close. Behold, the new logo for Diablo III. 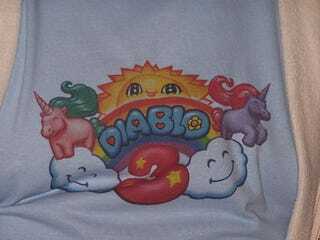 I really dig the ponies.The shirt is of course a direct response to the fans who cried out that Diablo III was too bright and colorful for a Diablo game. I'm a little sad that this isn't the real logo myself. Jay said that if there was a huge outpouring of demand thaqt these shirts might one day be offered to people for sale, so you might wanna start outpouring now. I need one of these. I briefly considered taking Jay's, but he seems like a rather tough fellow and I'd rather not take any chances. Outpour!